Do you find it difficult to speak to the Lord when you’re hurting, broken, or when your life is in turmoil? Each one of us goes through such moments in life, but perhaps the invitation is to express a little more faith in God who heals us when we’re broken. The Lord guides and lights our way, and although we may find it hard to understand at times, in His wisdom He hears and answers our prayer in His way. Sometimes we have to be like the blind man Bartimaeus in the Gospel of Mark - we need to talk to Jesus about our desires even though our needs and wants may be obvious and He already knows about them even before we utter a word. Recall your experiences of God as a Healer, Leader, Protector, Listener, Adviser, or Constant Companion. Remember the various ways the Lord has revealed Himself to you as you pray with the song, “Unspoken” by Jaci Velasquez. Do try not to leave your heart unspoken as the song advises. Whatever it is you may be going through, one thing is constant and true: God hears, answers, heals and as always, loves! May you find it easy to talk to the Lord today and may you speak of God’s love everyday! Have a beautiful and lovely Thursday! Many thanks to BehGerElle14 for the video! Want more music for the New Roman Missal? Please visit this link. This psalm celebrates God's power and presence. At the time this psalm was written, Israel had lived through almost constant warfare for 250 years or more. So reference to God as Lord of hosts, or as Lord, might in battle is a title given to God who has allowed Israel to conquer its enemies. As you prepare to sing this psalm, remember how God's presence in your life and the life of our church has led you to this day. Think about how God's power and presence can be made more manifest as you sing this psalm. To download the music sheets with a higher resolution, please click here. Click here to view the readings for next Sunday (February 2, 2014) via the US Conference for Catholic Bishops website. Are you at peace with yourself, with others, or with the way things are in the world? All of us desire peace. It is what our hearts secretly utter when we pray. It is what we hope each day may begin with and every night to be sanctified by. Peace is also a blessing from God. No matter how you are right now, allow the words of this Priestly Blessing found in Number 6:24-26 to be your prayer. Recall how God has blessed you, how he has kept you or how he has been gracious to you. How does that make you feel? Speak to God about this. Trust that the Lord has the best intention for you and wants to bless and keep you. Traditionally, the Hebrew priests blessed the people every morning after the sacrifice at the Temple. Today, many synagogues and churches end their service with this blessing as a benediction. May this song, "The Lord Bless You and Keep You," composed by John Rutter and performed by the Cambridge Singers comfort you in whatever situation you may find yourself in today. Let the Lord bless you and keep you in His love and providence. Have you found a setting of the New Roman Missal this Ordinary Time? Here's a setting of the song "Holy" using the new text. Learn the melodic line of this choral piece composed by Tinnah dela Rosa by viewing this video. 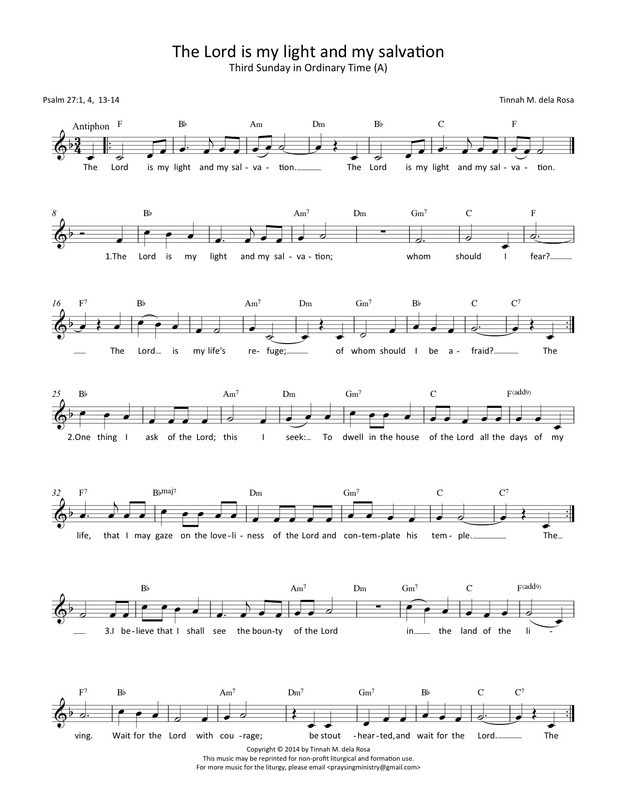 You may view the music sheet with the melodic line here. The full version with choir parts and chords are available in the Gaudium Mass songbook (available at the Claretian Bookstore and these outlets). Our two psalm settings for next Sunday are original compositions by our regular contributor Tinnah M. dela Rosa (in English) and our new contributor Mark Anthony B. Laroya (in Filipino). Songwriter Mark Anthony is a member of the Society of St. Vincent de Paul Philippine Youth. He serves with the Kasimba Choir at the Parish of St. Joseph the Patriarch in San Pedro, Laguna. We are happy to have him join our growing family of contributors at PraySing Ministry! To download the higher resolution music sheet of Mark Anthony, please click here. To download the higher resolution music sheet of Tinnah, please click here. Click here to view the readings in Filipino for next Sunday (January 26, 2014) via the Word and Life website. Click here to view the readings for next Sunday via the US Conference for Catholic Bishops website. Have you ever needed anything or anyone like you needed water? Recall the reasons why you need these things or people. Are these able to quench the thirst you have for love, for life, for purpose? Speak to the Lord about this in prayer. Ask God to show you the truth about you and your many thirsts. As you pray with the music video, "As The Deer," by Scripture Lullabies, ask God for the grace to seek Him that you may be able to long for Him just as the deer longs for running waters. We hope that you have a lovely Thursday! May your thirst for God be quenched as you pray and work this day. Many thanks to Scripture Lullabies for the video! Be a PraySing Minister in our growing online ministry! 1. Be an online minister. Connect PraySing Ministry to more people by promoting our posts and page. Simply like and share our posts every Tuesday, Thursday and Sunday on your timeline or tag as many friends whom you think might find the post helpful. No special skills needed - just an ability to like and share our posts. 2. Be a contributing writer. You can write short reflections about music videos that can lead others to pray or sing to God. Go check out our Thursday Music posts that comes out weekly to see some samples. Submission is one week before the post is scheduled to come out. You can contribute as frequently as you wish! Please send us a writing sample. 3. Be a contributing composer. You can share your compositions for Sunday Psalms (in English or Filipino). No need to computerize your composition. We can do it for you! Just make sure it uses the verbatim text of the psalm, has the suggested chords and is within a singable range for the congregation (usually one octave). Please check the readings either from the USCCB site or the Word and Life Publications site. Submissions must be sent at least 2 Sundays before the psalm is to be sung (for editing and computer notation purposes). You can contribute as frequently as you wish! Please send us a sample composition. 4. Be a contributing musician. You can submit a guitar or keyboard sample of the psalms we are sharing so that those who will sing the psalm can practice with it. No singing is necessary! Just a guitar or keyboard sample with the melody is enough. But if you can also sing, that would be wonderful! These may be submitted on Tuesday before the psalm is to be sung so that the psalmist has ample time to use the instrumental material. You can contribute as frequently as you wish! Please send us a sample of your work. Although our work at PraySing Ministry is pro-bono, this is a good avenue to share or hone your gifts and to give back to the church that has given us so much. It will also help enliven our collective worship experience and help others connect to God through music. Send us a message if you are interested or share this ad with someone who might be interested. We hope to hear from you! This psalm setting for the Feast of the Santo Niño is an original composition by Tinnah M. dela Rosa. This is the same psalm as the one from the Christmas Vigil Mass. To download the music sheet with a higher resolution, please click here. Click here to view the readings for the Feast of the Santo Niño (January 19, 2014) via the Euchalette website. To download the music sheets with a higher resolution, please click here. Click here to view the readings for next Sunday (January 19, 2014) via the US Conference for Catholic Bishops website. What are the treasures that you deem important in your life? Often times we find ourselves holding on to treasures that we regard as valuable. Recall the things, people, desires, projects and involvements you consider significant, valuable or important to you. Are these treasures fleeting securities? Ponder on this for a moment. The lessons we have learned from the recent calamities that befell our country, especially after supertyphoon Haiyan, have revealed to us the truth that all things in this world are temporary and fleeting. We invite you to speak to the Lord about the treasures in your life. What is the Lord's invitation to you as you pray with this song? How will you respond? May you recognize the face of of God in what truly matters in your life. Have a lovely Thursday! Many thanks to BehGerElle for the video! We are looking for more online ministers in our growing ministry! 1. Be an online minister. Connect PraySing Ministry to more people. Like and share our posts every Tuesday, Thursday and Sunday on your timeline or tag as many friends whom you think might find the post helpful. 2. Be a contributing writer. You can write short reflections about music videos that can lead others to pray or sing to God. Go check out our Thursday Music posts that comes out weekly to see some samples. Submission is one week before the post is scheduled to come out. You can contribute as frequently as you wish! 3. Be a contributing composer. 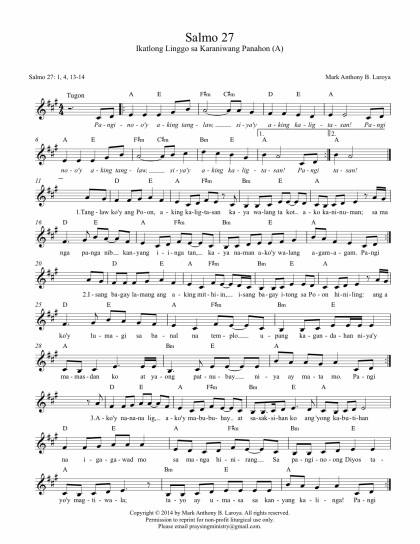 You can share your compositions for Sunday Psalms (in English or Filipino). No need to computerize your composition. We can do it for you! Just make sure it uses the verbatim text of the psalm, has the suggested chords and is within a singable range for the congregation. Please check the readings either from the USCCB site or the Word and Life Publications site. Submissions must be sent at least 2 Sundays before the psalm is to be sung (for editing and computer notation purposes). You can contribute as frequently as you wish! 4. Be a contributing musician. You can submit a guitar or keyboard sample of the psalms we are sharing so that those who will sing the psalm can practice with it. No singing is necessary! Just a guitar or keyboard sample with the melody is enough. But if you can also sing, that would be wonderful! These may be submitted on Tuesday before the psalm is to be sung so that the psalmist has ample time to use the instrumental material. You can contribute as frequently as you wish! To download the music sheets with a higher resolution, please click here. Click here to view the readings for next Sunday (January 12, 2014) via the US Conference for Catholic Bishops website. Do you have a New Year's resolution this 2014? What are the things that you wish to do differently as you begin this year? At the end of each year, most of us tend to come up with resolutions of things we wish to do differently. As we begin this new year, we invite you to take stock of your life and ask yourself: How bad or how good does it need to get for you to make changes in your life for the better? Speak to the Lord and ask him to shed light on the areas of your life that need to change. How is God nviting you to change this year? If it helps, we also invite you to pray with the song, "Change," performed by Tracy Chapman. May you allow the words of the song to move you to make a positive change in your life. God bless you! Many thanks to sedodedodedo for the video!